Would you get this new version or stick with the classic? I think there's no question what the answer is. That said, I bought my second edition pewter characters separately from eBay without buying the whole game. So one could always do that with this new game. Also, there's something to be said for the original long box edition vs. the smaller quad fold editions. I have to admit, I do wonder what those Rumor and "?" cards are. If done well, they could be a fun addition. The card art has changed for the suspects and the rooms, and there's some subtle changes to the weapon cards. I'm not sure it's for the better. In the original, Scooby was dressed as Colonel Mustard. Here, he's mostly generic art, having little to do with Col. Mustard. But they've changed from the original design mimicking the 1996 edition (which was part of the charm, though long forgotten now I suppose) to a more square presentation. The card backs are also different. Last edited by Murder by Death on Sat Feb 02, 2019 12:49 am, edited 1 time in total. I'm not sure it's for the better. In the original, Scooby was dressed as Colonel Mustard. Here, he's mostly generic art, having little to do with Col. Mustard. Actually from what I can see. Fred's Mr. Green card is the same as his token and box art look. You can see a tad of his suit. The Scooby card in question is generic art, but for a possibly rumor card marked "Pizza"
If that's the case (and yes I see purple backs now), then all the more reason to pick up the edition, as those "rumor/?" cards look like fun! However, if you don't have this edition, the original with Pewter character tokens is a must, particularly with the original artwork that mirrored the '96 edition artwork. Might I add, it is a bit weird to re-work the style of the cards, and format with contemporary "? 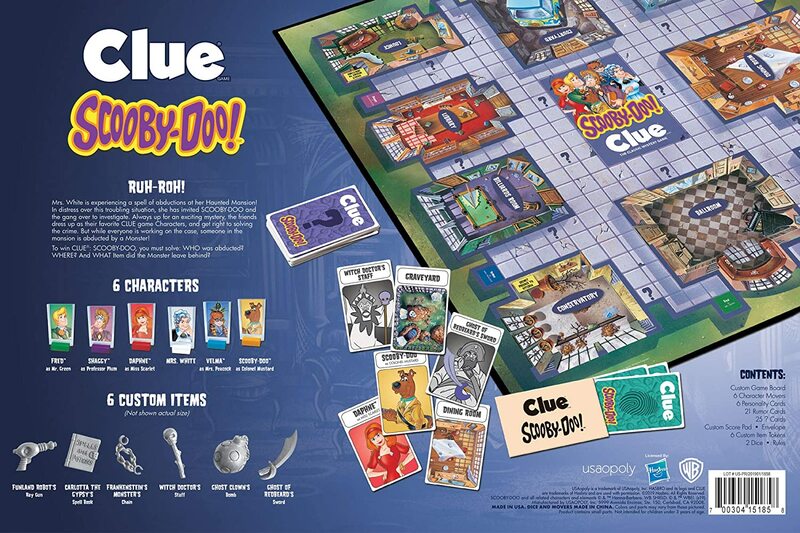 ", "rumor" and "personality" cards, but leave it branded with the old style Clue logo, especially since it has no connection to the original '96 edition which it was supposed to parody. I already have the older edition with the pewter pieces, so I most likely won't be purchasing another copy of it. One thing that's always bothered me about this themed version is that every character has a Scooby Doo counterpart except for Mrs White. They really couldn't have come up with a character to stand in as Mrs White after all these years? I seem to remember it's part of the premise where Mrs White invites Mystery Inc dressed as their favorite Clue character, but they really could have come up with something else by now to round off the cast with 6 Scooby Doo characters, even if it's not a third female character but rather a fourth male character like Scrappy Doo... Hmm, actually maybe Mrs White is better to include than Scrappy Doo. I mean, does anyone like Scrappy? Anyone? I've yet to meet anyone who did. Plus, to play devil's advocate, I guess it's kind of a minor come back for her after being booted out for Dr. Orchid. It just seemed to throw things off for me having Mrs White be the only original Clue character in a licensed Clue game. Oh no, you missed the sublime parody here. It’s brilliant. Mrs. White has been keeping the house open, the same one from the ‘96 game, but it’s decrepit and in disrepair. 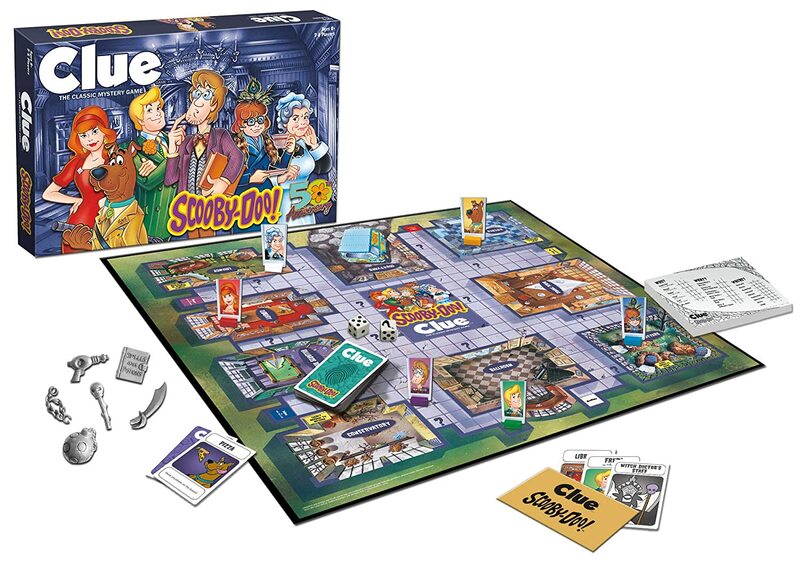 So one of the original Cluedo characters connects this game directly to Clue, and fits with every Scooby Doo mystery, where the gang is invited to solve a crime, usually a sweet older person, where sometimes the very person who invited them is the guilty party. Yes it could have been Scrappy, and I would have been fine with that. But this is so much better. Lol, well you do make a good argument in favor of how the game was laid out and pointed out things I hadn't considered before. Although honestly I still can't picture someone playing this version opting to play as Mrs White unless either it's a 6 player game or there's one player who's not much of a Scooby Doo fan. I do remember back when this game first came out picturing an episode of Scooby Doo where the Mystery Machine breaks down and the gang has to go to the nearest house to asked if they could their phone to call for assistance, which of course would turn out to be Tudor Mansion (or Arlington Grange). And so the episode resembles a game of Clue where the gang has to collect clues to solve the murder mystery, but also has them all terrified that this mystery is a murder case and that they're potentially in far more danger than they've ever been before. It could make for a great crossover parody like The Scooby Doo Project. The “Rumor” cards appear to be the evidence cards consisting of suspects, rooms and items. The “?” Are what interests me. But can’t really justify this price to find out. That said, now that I can see the “Pizza” card better, it’s not as clever as I thought. I’m not sure what Pizza has to do with ‘moving anywhere on the board’. It’s cute, but if the others are just as random, it doesn’t seem that interesting after all. In addition to the added “?” On the board spaces, they’ve also added colors to the start spaces, along with the Scooby gang’s names. The secret passage signs have also been slightly relocated. The good news is that they’ve returned to the larger first edition “book of spells”. The second edition had a much smaller token. It’s intresting that they’ve removed the “Where are you?” from the game name, considering that’s the whole point of the premise. And I see they’ve added “50th Anniversary” to the box top, but nowhere else on the game. That seems to be the reason to buy this edition, though it only appears one place. It’s still weird to me they updated everything else, but kept the old Clue brand logo. It’s just too bad for such a momentous release, they chose to go with the cheap pawns, rather than the pewter character tokens. Heck I would have taken plastic ones instead, like the latest Orchid edition, but sadly no. I wonder if they lost the molds? If any edition needs the ‘Card Revealing Mirror’, it’s this one — especially for the $40 price tag. That would have been a nice touch, as much as I detest it. Ugh. Now I have to get it. Food is a great idea for extra play cards with this theme. If you get around to it, I think we’d all love to see pics of the new cards. I have to wonder if this has anything to do with the cross-over episodes of Supernatural last year, when the guys went into an animated world to solve a mystery with Scooby and the gang (Supernatural also having a Clue game)? Last edited by Murder by Death on Sun Apr 14, 2019 5:46 pm, edited 2 times in total.